Representative Mark McBride is a respected businessman and community leader who has earned a reputation for helping people and getting results. Mark has the private-sector experience that is too often lacking in political leaders, having successfully built construction and homebuilding companies. He knows what it is to create jobs, make a payroll, and also give back to his community. 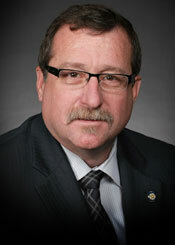 Successful in his first political race, Mark was elected to the Oklahoma House of Representatives in 2012. A lifelong conservative Republican, Mark represents District 53 which encompasses most of Moore, the state’s seventh largest city. Mark hit the ground running, serving as Vice-Chair of the House Utility and Environmental Regulation Committee in his first term, as well as serving on the House Judiciary Committee, where crucial issues like workers’ compensation reform were launched. In 2014 he was appointed by former Speaker Jeff Hickman to the Oversight Committee on the State Capitol Restoration. He served on the Energy and Natural Resources Committee for six years and was the Vice-Chair for four of those years. He has since changed his focus to education. Speaker McCall appointed Mark to serve as Chair of the Appropriations and Budget on Education Committee. He was appointed by former Speaker T.W. Shannon to represent Oklahoma on The Energy Council comprised of 13 states and four Canadian provinces. Mark currently serves on the Executive Board of Directors for the Energy Council. He also serves on the Board of Directors of the Southern States Energy Board. When Moore was devastated by an EF5 tornado in May 2013, Mark was immediately on the scene, even broadcasting his personal cell phone number to constituents during a televised news conference. He has been active in efforts to fund construction of storm shelters at our local schools, and remains a forceful advocate for recovery efforts. As co-founder of Shelter Oklahoma Schools, Mark has helped to raise more than $2.2 million to build shelters in Oklahoma schools. A fifth generation Oklahoman, the McBride family has called Moore home since the 1940’s. Mark graduated from Moore High School in 1979 where he was active in Future Farmers of America, serving his junior and senior years as vice president. He attended Northwestern Oklahoma State University before going into farming and ranching operations that he managed for several years. Mark also has worked in the oil and gas industry in Oklahoma. A devoted father and grandfather, Mark has two grown daughters, two grown sons and six grandchildren; another son was killed in an automobile accident when he was 21. In 2014 he married his beautiful wife, Jennifer and welcomed her two sons and daughter into his family. In addition to local church work, Mark has been involved in several areas of mission ministry and humanitarian aid. Mark is the Founder and President of Thousand Hills Mission – a non-profit organization dedicated to providing agricultural and veterinary assistance to the people of developing and Third World countries. He has consulted with mission projects in Central America, Eastern Europe (Bosnia-Herzegovina) and Africa. Since 2003, Mark has personally led mission teams to remote village areas of Nicaragua and Africa where they help with agricultural, veterinarian and humanitarian aid projects.